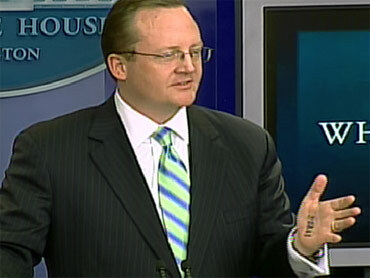 Following President Obama's surprise appearance at the White House press briefing, press secretary Robert Gibbs garnered laughter from the press corps by holding up his hand to reveal that he had written notes on his palm in black marker. Gibbs' move was a jab at Sarah Palin, who was shown to have written notes on her hand at a speech at the Tea Party convention Saturday after making an implicit criticism of the president for using a TelePrompTer. Gibbs quipped that he had made the notes in case he and his family are snowed in by the storm approaching Washington. He said the words written on his hands included "eggs" and "milk" and that he had written "bread" but crossed it out. 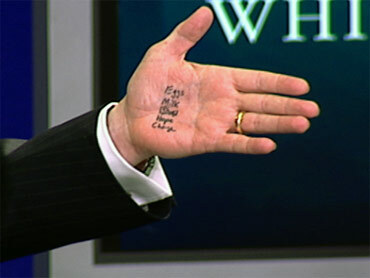 A close up of the palm also revealed the words "hope" and "change," which Gibbs said he included "just in case I forgot that." Palin was shown to have written "Energy," "Budget cuts" (which was crossed out), "Tax," and "Lift Americans Spirits" on the inside of her left hand. She later mocked the controversy by writing "Hi, Mom!" on the same hand. Gibbs said later in the briefing that he didn't watch the Tea Party convention and called it "a very successful private enterprise," an implied criticism of the for-profit event where Palin was reportedly paid a $100,000 speaking fee.